High accuracy: uses 13 sensors to give accurate readings every time; one-step operation: just press the button; when placed on wall LED lights instantly indicate studs; deep sensing: more sensor pad area than other scanners results in deeper scan; triple accuracy technology analyzes and triangulates data from all the sensors for highest accuracy; Built-in bubble level makes this 2 tools in 1! The Pros Ensor 710 incorporates innovative stud sensing technology that instantly finds hidden studs. No sliding is required. This patent-pending detector senses the wall in thirteen locations simultaneously, then immediately illuminates the display elements that are in front of a stud. The Pros Ensor 710 is faster, less error prone and more accurate than other products on the market. It is the easy way to find studs. - advanced Multi-Sense technology senses the wall in multiple locations simultaneously and uses data from many readings to accurately determine the position of studs, operates effectively even through difficult architectural construction features (such as wall and ceiling textures, uneven plaster thickness, uneven paint, and difficult wallpaper, thick walls, etc. ) that can cause other detectors to fail. - bright LEDs lights illuminate to indicate the position of hidden objects making it very easy to visualize the position of studs. 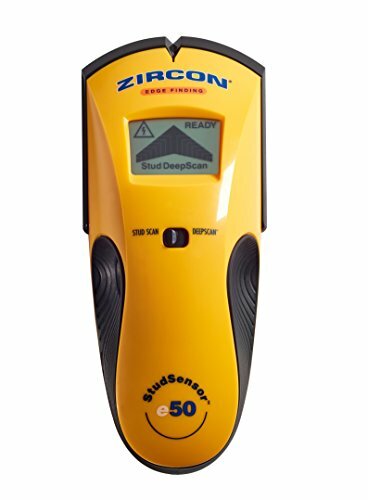 - The only stud Finder available that does not require swipes across a wall to determine the location of studs, so that the readings are immediately accurate. - identifies the width of hidden objects so that you not only know the position of hidden objects, but so you also know the size of them. - can identify the position of multiple studs simultaneously. This is particularly useful for when there might be two or more studs in close proximity, which can often confuse conventional stud finders. - The Pros Ensor 710 has more sensor pad area than conventional stud finders and can sense more accurately through many real-world architectural features such as texturing, uneven plaster thickness, uneven paint, difficult wallpaper patterns, etc. - deep scanning is always active (up to 1. 5"). - The Pros Ensor 710 can be initialized at any position along a surface. - ergonomic soft grip. Automatic Calibration, Big LCD Backlight & Sound Warning, Simple and Practical. studs, joists, pipes, live AC wire behind walls, floors and ceilings. 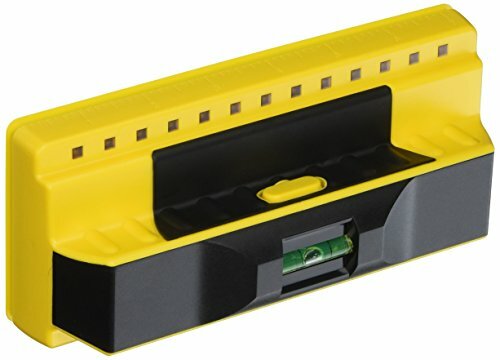 This stud finder wall scanner provides four scanning modes in total for detection. Depending on the tasks you have, you can switch to the desired mode. 4/ AC SCAN: Detects live unshielded AC wires up to 2 in (51mm) deep. Step 1: Power on the stud finder and choose the scanning mode. the stud finder will sound a short beep and the display bars will be cleared. Step 4 : When the stud finder detects an object, the stud finder will beep continually and will display on the LCD screen (if available). 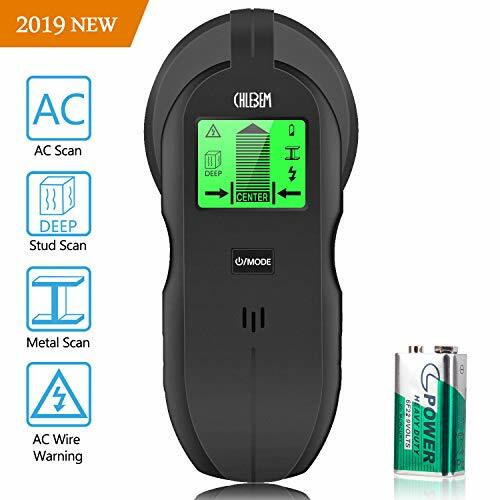 Accurately & Fast Effective CHLEBEM stud finder is an electronic wall scanner with multi-sense technology which can accurate and quickly locate studs/wood/AC wires in multiple locations on your wall.Whether you are a professional, homeowner or a DIY enthusiast, you can find great use in this digital stud finder. 4 in 1 Multifunction Plus Deep Detection The stud finder wall scanner provides four scanning modes (stud scan, deep scan, metal scan and AC scan) make it ideal for both tradesmen and home carpenters. With this stud finder, you can immediately find a suitable place on the wall without making any extra holes. Big LCD backlight & Sound Warning The stud finder wall scanner features large LCD display together with the big sound warning to detect the accurate location of the objects. 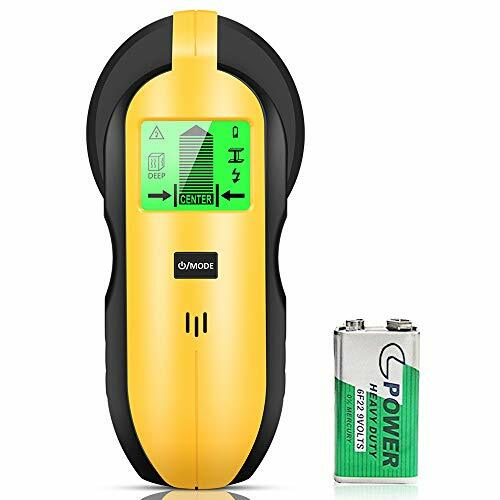 When find the material, the LCD display will indicate the direction and the intensity of beeping tells whether you are more close to the target.The fast detection saves users time and efforts, making the task completion easier. 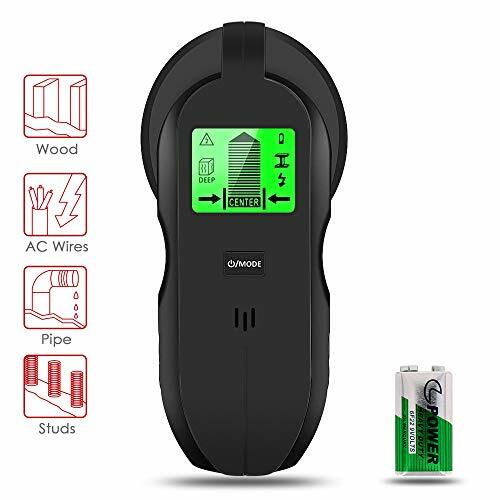 Simple practical This stud finder wall detector can quickly Locate the metal wood AC wire that are hidden in the walls, floors and ceilings of your house, help you avoid hazards while installing TVs, cabinets, garage shelves etc. If you have any questions, please contact us as soon as possible, we will give you a satisfactory solution. Perfect stud sensor for home renovator and decorator!! MEET ALL YOU NEED - Package includes : 1x stud finder , 1x 6F 9V battery and 12-month warranty and lifetime friendly. It is light weight and has ergonomically designed one-key-operate handle. 3 in 1 detection - With automatic calibration for easy and precise detection, there are three modes to select : wood studs, metal objects (rebar, studs and steel/copper pipes) and live wiring. 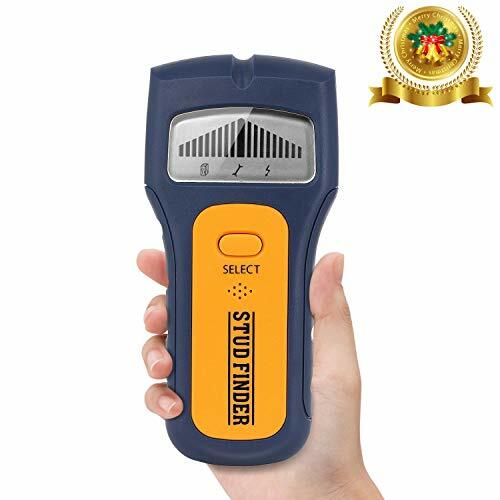 Accurate Detector Technology - This stud finder can locate center of wood studs up to 3/4-Inch (19 mm) deep, metal studs up to 11/5-Inches (30 mm) deep, Wire Warning detection indicates the presence of live wire up to 2. 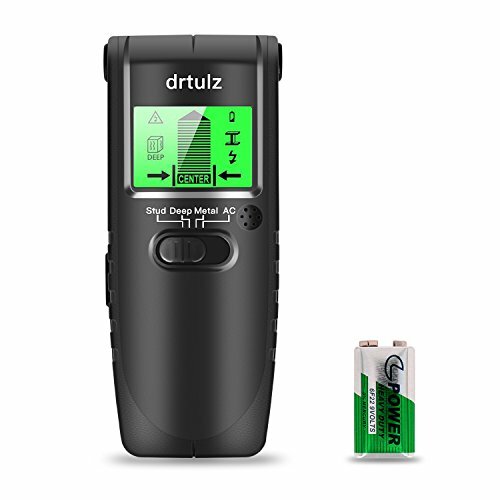 High Efficiency - The easy-to-read LCD screen accurately displays what type of stud you are looking for as well as its position and the battery status of the device. Easy to use - Only two buttons ,first select the probe type ,then just press and hold the side button and scan horizontally across the object surface. Auto power off without any operation after 60 seconds . Know what's behind the wall before you take on that job with a wall scanner! The Bosch GMS 120 Electronic Multi Scanner finds magnetic and nonmagnetic metals, power cables, wooden substructures and even plastic pipes! An audible alert and illuminated graphical display gives you the information you need to proceed with confidence. With its three modes, Bosch s GMS120 digital multi-scanner is an aid in most situations, as its modes cover wood studs, metal objects such as rebar, studs, and steel/copper pipes, and live wiring. It has precise automatic calibration that makes use easier and an automatic center finder, which pinpoints the center spot of the wood or material that has been detected. One Bosch GMS120 digital multi-scanner, hand strap, one 9-volt battery, and carrying pouch. Bosch s GMS120 digital multi-scanner detects multiple materials, has a user-friendly design, and easy detection status checking (click each to enlarge). DETECTION: The Bosch GMS120 Digital Wall Scanner features multi-mode laser detection for wood studs, metal objects (rebar, studs and steel/copper pipes) and live wiring. DISPLAY: Features an illuminated graphical LCD display to indicate mode, detection strength, and more. The large detection ring flashes green for no object found, orange for object near and red for object found within the sensor range. CENTER FINDER: This wall scanner includes a center finder that pinpoints the object center with an audible detection signal with an on/off button. Upgraded stud finder for home renovator and decorator!! 1. The measuring range for alternating current is 85-240 volt , sometimes the alternating current will influenced by environment , humidity or others which will also influence the measuring accuracy. 2.If you know that there are lines in a particularly location, but you can not find them with the sensor in "AC" mode, then use "METAL" mode. Electrical lines may be shielded by metal cladding. UPGRADED VERSION - FOUR SCANNING MODES You can switch to the required mode.The STUD SCAN is used for finding and locating the center and edges of wood or metal studs up to 3/4 in (19mm) deep. DEEP MODE for scanning walls for 1 1/(2 ) in (38mm) deep. METAL SCAN for locating and detecting metal (such as 1/2 inch rebar) up to 2 1/(4 )in (60mm) deep. AC SCAN for locating live AC wires up to 2 in (51mm) deep. 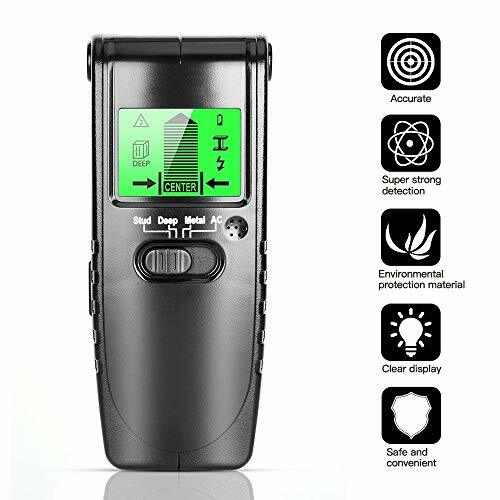 HIGH EFFICIENCY The wall scanner detector has a graphical LCD display, which indicates many clues in detection, such as detection mode, signal intensity, automatic calibration, battery indicator, and has maximum readability. When the battery power is low, the low battery indicator icon shows you to replace the new 9V battery in time. EASY TO USE The stud wall scanner can quickly locate the metal nails, tubes, steel bars, and the beams on the walls, floors, and ceilings, as well as the edges and centers of the electrified AC wires. Select the probe type ,then just press and hold the side button and scan horizontally across the object surface. Auto power off without any operation after 60 seconds . ACCURATE CALIBRATION The wall scanner will be automatically calibrated when it opens. Calibration is done by positioning the device on a wall without nails, alternating wires or metal. When you have detected an object with the wall scanner, it will beep continually. The big sound warning together with the LCD screen helps detect the accurate location of the objects. MEET ALL YOU NEED Package includes : 1x stud finder , 1x 6F 9V battery and 12-month warranty and lifetime friendly. 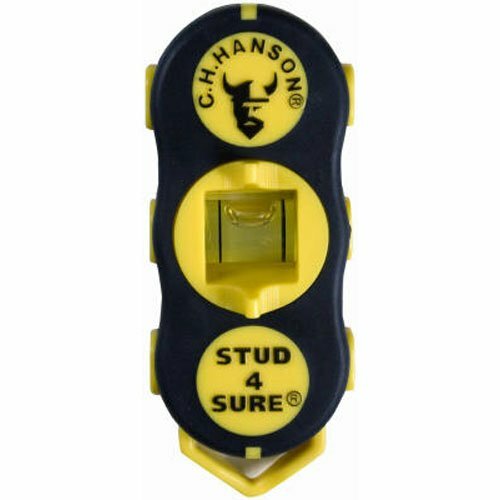 The stud finder is light weight and has ergonomically designed one-key-operate handle. 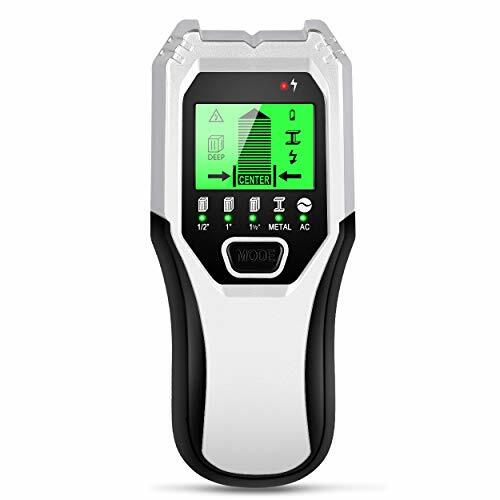 The Zircon MultiScanner 740 center finding electronic wall scanner quickly and easily locates studs, detects metal, locates live, unshielded AC wires and allows you to mark your target. Complete with the latest technology in density detecting software and circuitry, an ergonomic body design, and an erasable marking system. Unlike other wall sensors, scanners and stud finders, the MS 740 is uniquely designed with a "floating head" that keeps the scanning surface level on textured or rough surfaces so results are more accurate. The 4-mode switch makes it easy to change functions while the ultra-bright display screen, dual SpotLite Pointing System, and audio tone all indicate the location of the target. The Signal Strength Indicator helps to distinguish between shallow and deep targets. The MultiScanner 740 also includes ACT (Auto Correcting Technology) that automatically corrects common user errors, such as when scanning begins over a stud, in addition to a low battery indicator to alert its users to replace its battery for optimal performance results. In StudScan mode, the multifunctional 740 locates the center, edges, and direction of wood or metal studs up to 3/4 of an inch (19 mm) deep. Switch over to DeepScan mode and double the scanning depth to 1.5 inches (38 mm). Metal Scan mode of the MS740 provides the ability to locate non-ferrous metal, such as copper pipes, up to 1.5 inches (38 mm) deep and ferrous metal, such as rebar, up to 3 inches (75 mm) deep. Using Metal Scan mode, studs can be found behind lath and plaster walls, tile, drywall and stucco walls by identifying the consistent pattern of screw or nail heads in the studs. Additionally, the MS 740 is programmed with a WireWarning Detection feature that indicates the presence of live unshielded electrical wires up to 2 inches (50 mm) deep when using the stud and metal scan modes. To detect, locate, map, and trace the live wires, simply switch over to the AC Scan function which finds and traces live, unshielded AC wiring up to 2 inches (50 mm) deep. Then use the integrated, erasable marker to note the progression of the wires, studs, or other objects behind the walls. With the Zircon MS740, you can safely maneuver through the most complicated of projects with the professional confidence that comes from owning a Zircon. A Professional Tool For Professionals And Non-Professionals! EONLION wall scanner stud finder is a technologically advanced multi-scanner that is made for construction, electricians, masons, carpenters, homeowners, and others who need reliable detection. The wall detector uses different scanning modes to detect the center of wood and metal studs and hot unshielded AC wiring behind walls, floors, and ceilings. For safety the product always looks for and warns users of the presence of hot AC in all modes. The metal detecting device is wireless and portable, and it needs a 9V battery(excluded) to work. Multi-mode Detection: The stud finder is used for finding and locating the center and edges of wood or metal studs up to 1 1/(2 ) in (38mm) deep, while AC live wire up to 2 in (51mm) deep. Graphical LCD Display: The multi function wall scanner detector has an illuminated graphical LCD screen, which indicates detection mode, signal strength, automatic calibration and battery indication.Please replace a brand new 9-volt battery when the Low Battery Indicator icon displays. Make Your Life Easy: This Classware stud finder will save your time and efforts, making the task completion EASIER. This multi-scanner can detect the edges and center of metal studs behind walls, floors and ceilings as well as the live AC wires. It is easy, fast and even fun to to find all of the wires and studs that are hidden behind the walls of your house without calling a professional electrician! Try it out and see for yourself! Smart Sound Warning: The wall detector offers BEEP SIGNAL ALERT reminding you of the stud's position/location. Ergonomic Design: Light weight, compact handheld body and anti-slip design, convenient to use as a handy household device. Imagine you were trying to put up a TV bracket, shelf unit, or even just a set of coat hooks on a drywall, you can't use drill a hole into the plasterboard, because it's going to break when you screw something into it and put pressure on the weak plasterboard. This is why you need to nail or screw into something stronger, the 'stud'. Tavool stud finder is the top choice for you to find the STUD behind the drywall and hang shelves, cabinets, or decorative items. A good stud finder can be the difference between a successful DIY home project and disaster. Tavool stud finder is professionally designed! In addition, Tavool stud finders uses the UPGRADE INTERNAL SENSORS. It senses a change in density in the space behind the wall and locates the stud center with GREAT ACCURACY. Tavool stud finder is perfect for normal scanning of wall ceilling floor and finding joists, beams, and studs in almost all types of stud walls, for example, finding studs on drywalls, plaster wall, finding the beams in the ceiling, floor, locating metal behind walls or other surfaces, even locating metal/screws behind tiles. If you are a DIY home projector or professional contractor, Tavool stud finder is what you are looking for. TAKE IT HOME AND START YOUR PROJECTS ! 4 SCANNING MODES UP TO 2.3INCH DEEP - The STUD SCAN is used for finding and locating the center and edges of wood or metal studs up to 3/4 in (19mm) deep; DEEP MODE for scanning walls for 1 1/(2 ) in (38mm) deep; METAL SCAN for locating and detecting metal (such as 1/2 inch rebar) up to 2 1/(4 )in (60mm) deep; and AC SCAN for locating live AC wires up to 2 in (51mm) deep. Quickly and easily locates studs, detects metal, locates live, unshielded AC wires. 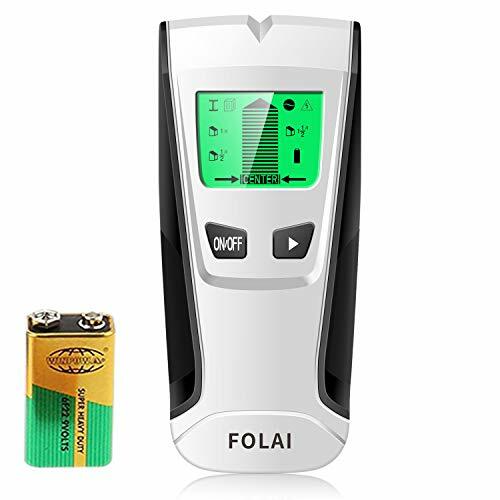 FOR SAFETY, WireWarning Detection Works in both STUD SCAN / DEEP SCAN / METAL SCAN MODES - Tavools stud finder features four scanning mode to meet your various needs. For Safety, in all modes, this wall scanner always detect and indicate the Live AC Wire. 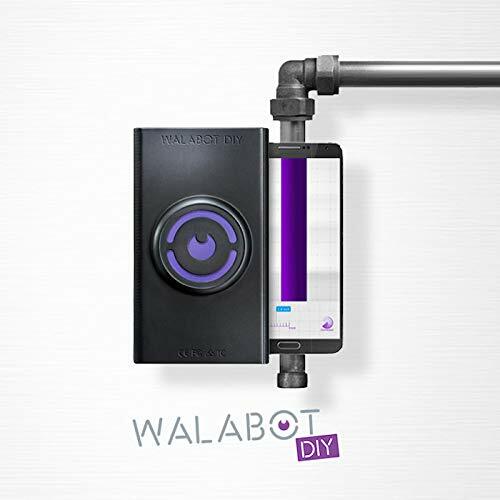 With this multi purpose wall scanner, it is also easy for you to avoid the metal behind the wall. NO FEAR FOR DRILLING TO A WIRE OR A METAL! 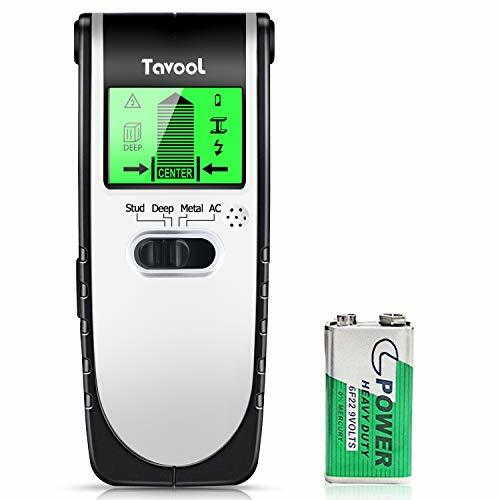 EASY TO SEE VISUAL DISPLAY WITH BEEP SIGNAL ALERT - Tavool Multi-Function wall scanner detector has a GRAPHICAL LCD DISPLAY, which indicates many cues in detection, such as detection mode, signal strength, calibration, battery indication with maximum readability. Togather with the BEEP SIGNAL ALERT, users can detect the accurate location of the objects EASILY. 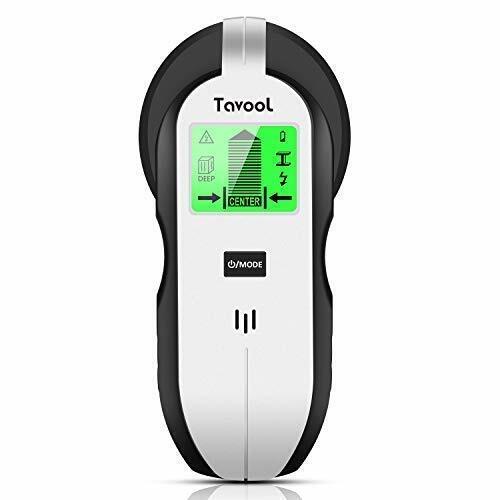 HASSLE FREE AFTER-SALE SERVICE AND 100% WARRANTY - Tavool specializes in stud finder for years and all the Tavool stud finders is high quality bulit. 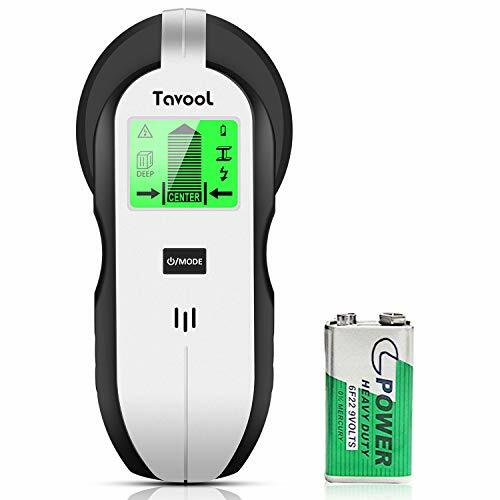 Tavool stud finder not only gives you top quality and great accuracy, but also provide muti-functions to meet your practical needs on ceiling, drywall, lathe wall, plasterboard wall, wallboard etc. Every TAVOOL product includes a 45 days money back & 24-month warranty. Please contact us if you have any questions! MULTIPLE MODES - In stud scan mode: Position the edges of the metal and dowels on a common wall up to 0.71" (18 mm); In metal scan mode: Place metal, such as iron, copper, aluminum tubes At 1.18 inches (30 mm);In AC line scan mode: Position the AC line to 2 inches (50 mm). SMART FUNCTION - When the stud is positioned, stud finder will beep to indicate the position of the stud. The illuminated graphic LCD and sound signals indicate the detected device strength, position and battery status. EXCELLENT AFTER - SALES SERVICE - we will provide a 30-day money back guarantee. If you have any questions about the stud detector, please feel free to contact us and we will get back to you within 48 hours. 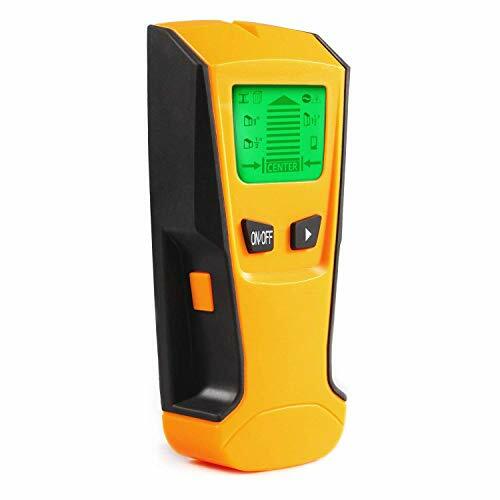 Product description: DMS04 stud finder is ideal for plumbers, contractors, carpenters, masons, home renovators, construction workers, electricians, DIY enthusiasts and others who need reliable detection to quickly and accurately identify the wood and metal, copper and steel pipe, rebar, or AC wire hidden behind the walls. Is it perfect that you can check whether anything is behind the wall without guess, to locate the edge and center of the stub? Is it nice that you are told if the location close to electric line so you can stay away from it? 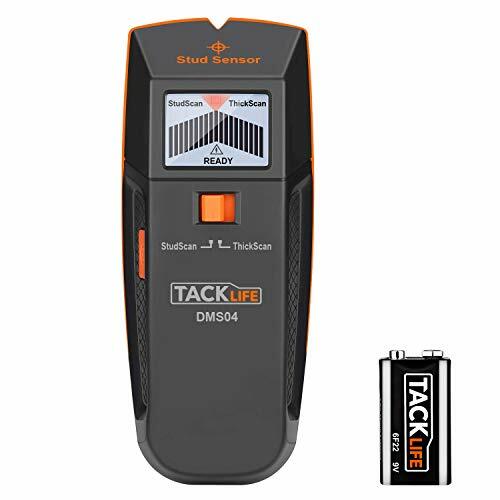 Don't need to pay a professional electrician to finish testing, you can do it by yourself with Tacklife DMS04 stud finder. DIY will have more fun. Why choose Tacklife DMS04 stud finder? The stud finder is easy and convenient to locate stud edges with a LCD display, daily life will be easier The stud sensor can be chosen with the StudScan and Thickscan modes, easier measurement A perfect tool for plumbers, masons, home renovators, construction workers, electricians, DIY enthusiasts,and others who need reliable detection Kindly reminders: 1.Sensoring depth and accuracy may be affected by temperature, humidity, wall texture and conditions of stud such as humidity, width and curvature of edges. 2.DMS04 stud finder can scan effectively the following wall materials: Gypsum drywall, plywood sheathing, bare wood flooring, coated wooden wall and wallpapered walls. 3.Please read the user manual carefully before use the stud finder. ADD TO CART AND START YOUR PROJECT SAFE! We offer you 365-Days 100% Risk-Free Satisfaction Guarantee to let you buy with confidence, any question, please contact us freely, always response in 24 hours. 4 Beep sound and center column will tell you where the center is. FOUR SCANNING MODES: The stud finder provides four scanning modes in total for detection. Depending on the tasks you have, you can switch to the desired mode. Widely Application: Multi-scanner stud finder for Wood, Metal, Deep, AC Current. Quickly locates edges and center of wood ,wall studs, metal pipes,wooden joist, rebar behind walls, floors and ceilings, also indicates the presence of live AC wire. Easy to Use: Only 2 buttons, first press ON/OFF power button, then select the Mode Switch Button,after that just press the Scan button(at the left side of the device) and scan horizontally across the object surface. Calibration: Before detection, please keep the scan button pressed for 1-2 sec, and it will get calibrated. Beep sound will remind you when job done. You may need to recalibrate your device if the button was released accidentally at the beginning or you think it need to do so during the process. 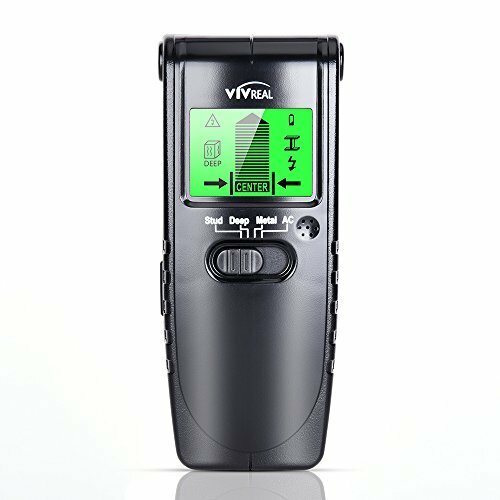 Easy to Read: Features with LCD backlight, providing a clear look even in low light conditions, which indicates detection mode, center pointing, low battery indication. Audio indication, with beep sound for reminding. Our stud finder make it easy to find metal wood AC wires hidden in the walls, floors and ceilings of houses. Warming Tips: When not in use, please take out the battery to prevent damage to the stud finder!!! After sales: If there is any problem with the product, please contact us. 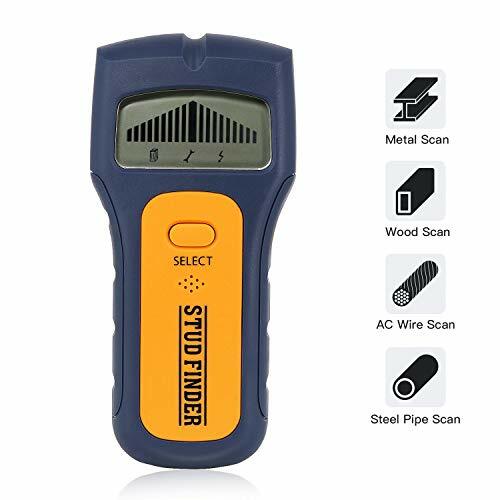 4 in1 Stud Finder - This stud finder includes three different scanning modes for wood, beams, joists, metal, AC wires as well as deep embedded objects behind the floor, ceiling, and walls. In the Stud Scan Mode: locates the edge of metal and wood stud in normal walls up to 0.71 inches(18mm); In the Metal Scan Mode : locates the metal such as iron, copper and aluminum pipe up to 1.18 inches(30mm); In the AC Wire Scan Mode: locates the AC wire up to 2 inch(50mm). 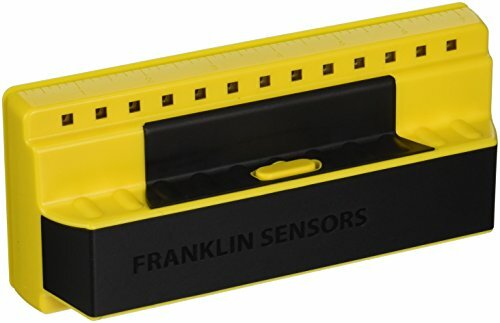 Automatic Calibration - Multi-function stud finder uses the most advanced sensor technology to accurately and quickly locate studded wood metal AC wires! Turn on the stud finder and complete the calibration until the BEEP sound and screen display disappear. Automated calibration before use provides users with maximum reliability and accuracy. Then put it on the wall. Once the edge of the stud is picked up, the stud finder will flash and beep. LCD screen And Audible Warning - Display the detected material and the exact position of the material - The stud finder has a LCD display and an audible warning to detect the exact position of the object. When the material is found, the LCD display will intensify the intensity of the indication and audible warnings, informing the user that it is closer to the target. Audible and visible prompts keep users informed. 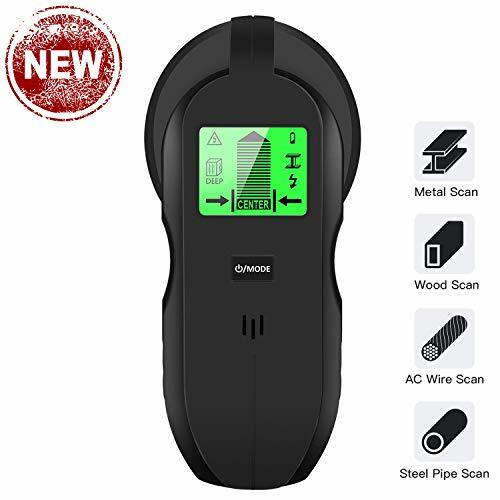 Widely Used and Refund Within 30 Days - This stud detector can quickly find metal wood AC wires hidden in the walls, floors and ceilings of the house to help you install TVs, cabinets, garage racks and more. Avoid danger. This stud detector can be refunded within 30 days. 1. Stud scan: Locates the center and edges of wood and mental studs up to 3/4 in. (19mm) deep. 2. Deep mode: Locates the center and edges of wood and metal studs up to 11/2 in. (38mm) deep. 3. Metal scan: Detects metal (such as 1/2 inch rebar) up to 2.36 in. (60mm) deep. 4. AC scan: Detects live unshielded AC wires up to 2 in. (51mm) deep. 7. Scanning in metal mode. 8. Scanning in AC mode. 3 IN 1 Detection Easy and precise detection with automatic calibration, there are three modes to select: wood studs, metal objects (rebar, studs and steel/copper pipes) and live wire. Easy to use Only three buttons, first press ON/OFF power button, then select the Mode Switch Button, after that just press the Scan button(at the left side of the device) and scan horizontally across the object surface. Higher Efficiency it can locate the edges of wood or metal studs up to 11/2 in. (38mm), metal rebar up to 2.36 in. (60mm) and AC wire up to 2 in. (51mm). Intelligent design Large LCD digital display with illuminated graphical and sound signal indication. After about 1 minutes of non-use, the tester automatically performs a power off to save batteries. MEET ALL YOU NEED Package includes 1x stud finder, 1x 6F 9V battery and 12-month warranty and lifetime friendly. It is lightweight and has ergonomically designed one-key-operate handle. WIDE DETECTION RANGE - The maximal detection range of metal parts: 3-inch; AC wire: 2-inch; Stud parts: 1.5-inch. Easy to find the stud center and edges, accurately locates metal pipes, live wire, stud, wooden frames, rebars and joists which hidden behind walls, floors and ceilings. CENTER FINDING - AC wire warning flags will show on the LCD whenever live wires was monitoring in three detecting modes. Show Column will elevating as wood stud finder approach item's center, and the highest column site is the center of studs. Beep sound will remind you when you find the target. CALIBRATION - Before detection, please keep the scan button pressed for 1-2 sec, and it will get calibrated. Beep sound will remind you when job done. You may need to recalibrate your device if the button was released accidentally at the beginning or you think it need to do so during the process. EXCELLENT BACKLIT SCREEN - Features with LCD backlight, providing a clear look even in low light conditions, which indicates detection mode, center pointing, low battery indication. Audio indication, with beep sound for reminding.